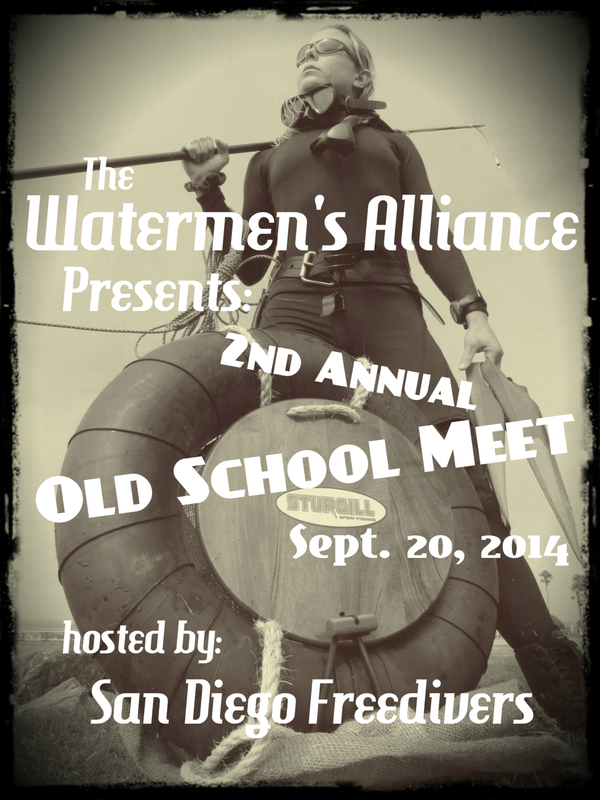 The Watermen’s Alliance is proud to announce it’s 2nd annual “Old School Meet”!!! 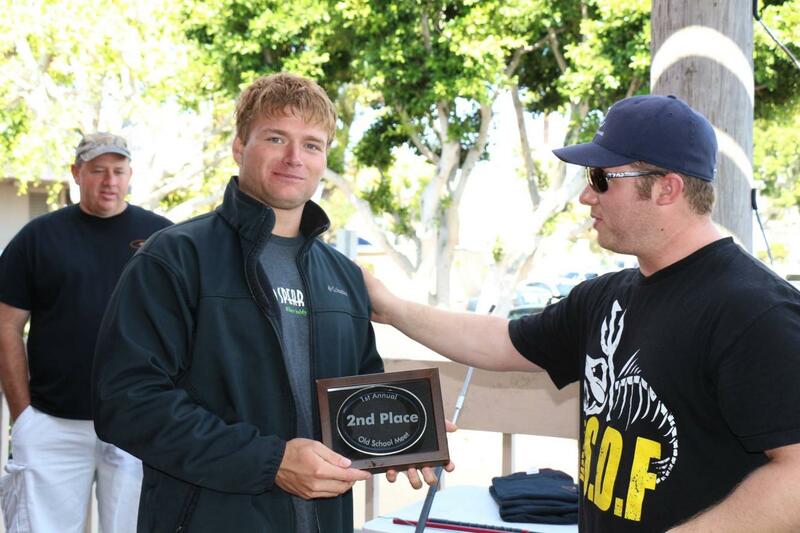 This meet will be a unique format and is intended to honor the early pioneers of spearfishing. This meet will be an “iron man” meet with no wetsuit and no modern conveniences. As such, it is planned when the water is warm on Sept. 20, 2014 in La Jolla, CA. 1. The Meet will be polespear only. No modern spearguns are allowed. So-called “hali-hammers” and standard polespear/hawaiian slings are allowed. 2. No wetsuits are allowed. Competitors may wear a swimsuit and rash-guard or t-shirt. 3. No modern freedive fins are allowed. Modern-style longblade fins are specifically excluded from this meet. Short blade “scuba” fins or churchills etc… are allowed. 5. No weight-belts are allowed except a belt used to hold gear (i.e. fish stringer). No wight-belts or harnesses are allowed. 6. No boats are allowed with the exception of kayaks. Kayaks, paddleboards and floats are allowed and encouraged. No motorized transportation is allowed. 7. Authentic gear from the 1930′s to the 1960′s is encouraged within the rules above. 8. Any question about the gear to be used or the rules of the meet should be directed to the Watermen’s Alliance for an answer prior to the day of the meet. On the day of the meet, any gear or action contrary to the rules will result in disqualification at the discretion of the meet organizing committee. 1. A maximum of five fish may be submitted for the Meet. 2. 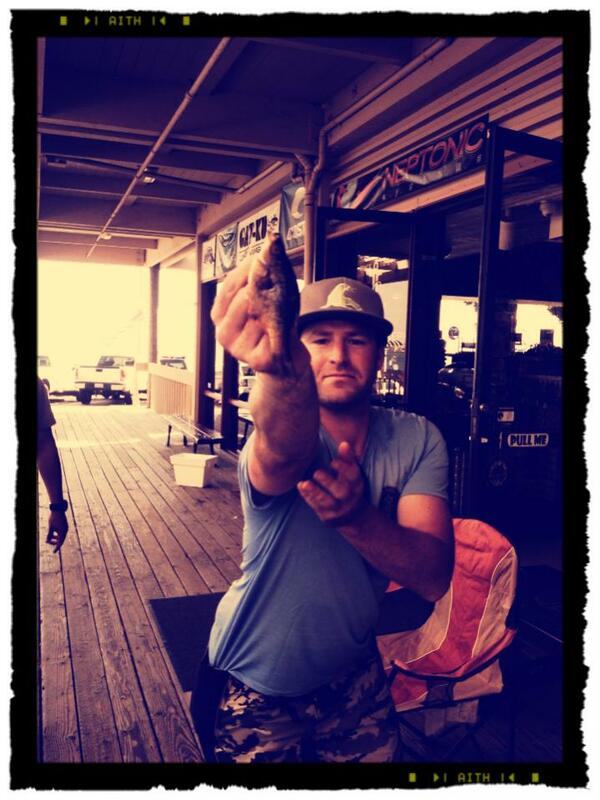 All fish must be caught and must comply with California Department of Fish and Wildlife regulations. Fish will be weighed and measured. Size limits will be strictly enforced. 3. A maximum of three fish of a single species may be submitted. 4. No sharks, rays, skates or molas may be submitted. 5. All fish must be caught and captured via breath-hold only. No artificial breathing devices, scuba or “spare-air” may be used to capture any fish submitted. 6. All competitors must have signed the release of liability and entry form prior to the start of the meet. 7. Fish must be submitted at the weigh-in circle by the competitor personally prior to the end of the meet. 8. Any dispute with regard to the spirit or meaning of the rules above will be decided by the organizing committee. This is a five fish meet (three fish max per species). Each fish will be worth three points. 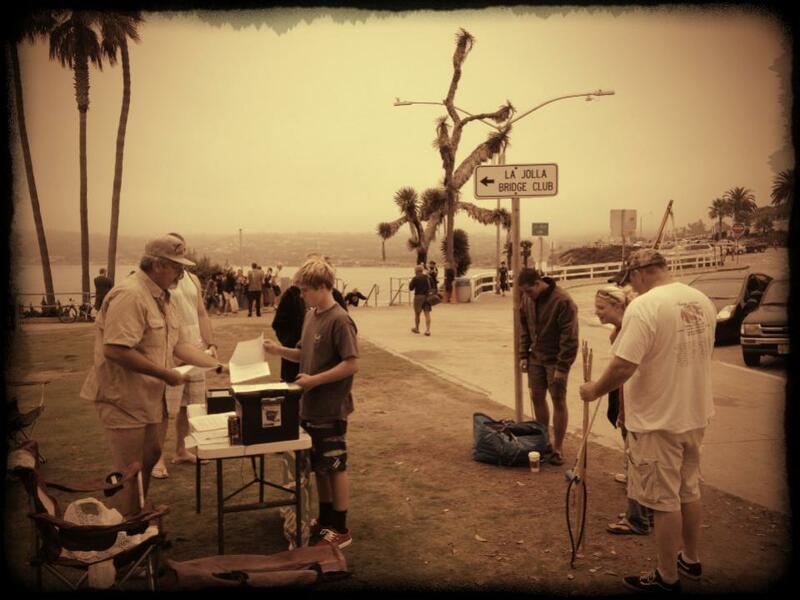 Each fish will be weighed for a total of one point per pound. This is a Scramble style meet. 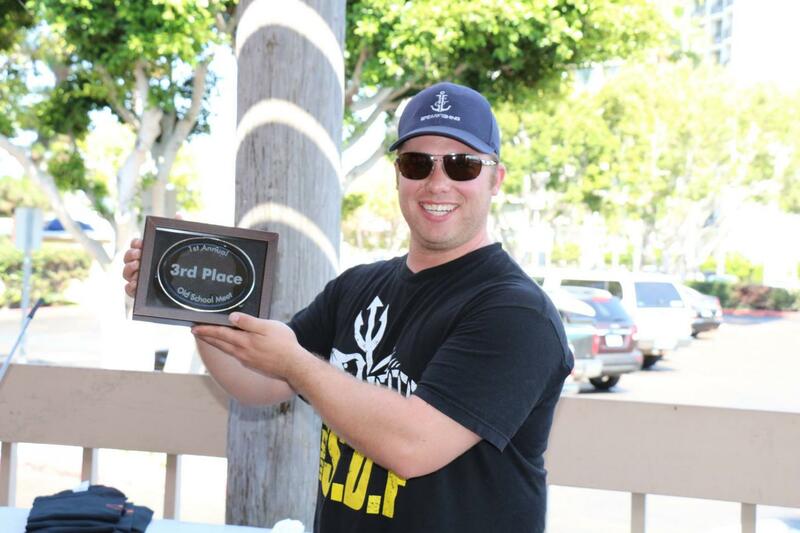 Competitors must be at the sign-in location prior to the start of the meet and must submit their fish at the weigh-in circle prior to the end of the meet. 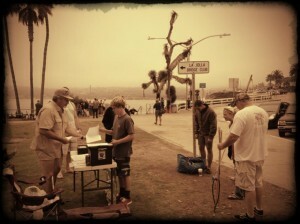 Sign-in location will be at La Jolla Cove in San Diego, CA. Sign-in will be between 6:00-6:30 AM. You may show up early to sign-in but you will not be released until 6:00. Any competitors who do not arrive at the sign-in before 6:30 AM will be disqualified from the meet. Weigh-in location will be announced soon. Pictures and Reports from the 2013 Old School Meet! I can assure you that when we originally thought up the meet, we didn’t realize how hard-core it was going to be. 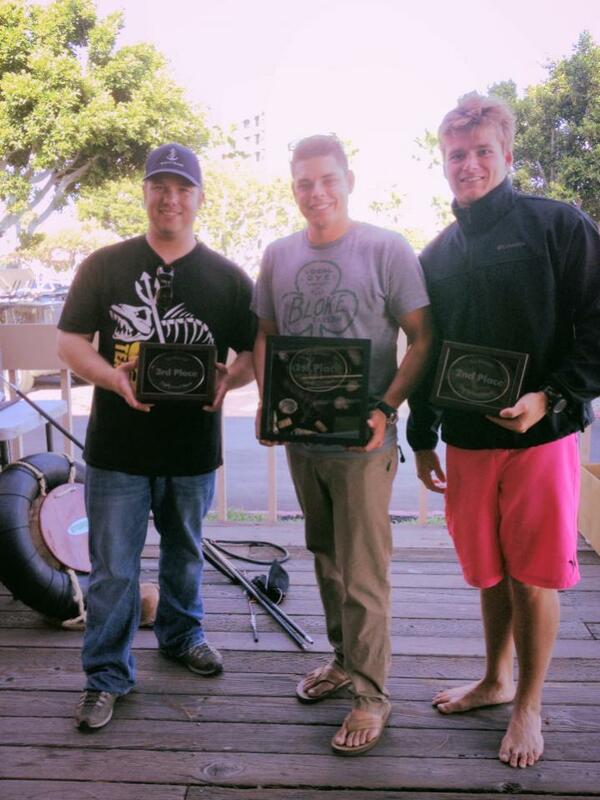 We had several top-notch divers competing and the fact that a stringer of perch/opaleye won it illustrates how challenging the competition was. Some things I learned were that you really have to adjust your dive style for the meet. I planned dives in 30 or so minute increments because that was how long I could be in the water and still get out, warm up in a reasonable time and get back in at another spot. The water was cold…… really cold. I was laughing when I heard some of the old guys used crisco or butter to coat their bodies and stay warm. Now I believe it. Anything to stay warm….. The first immersion was a shock but after my whole body went numb, I found the water wasn’t so bad (or at least that I could ignore the cold). Every drop was a challenge. The lack of weight-belt was a unique challenge since I was still buoyant and the short little fins didn’t give much thrust to keep me down. I didn’t plan on diving deeper than 20 feet anywhere because it was not very practical. Half way through the meet, my old fins from the 40′s started to split on me and I had to switch to a backup pair of modern replicas. I actually prefer the fins from the 40′s. The short fins and lack of weight belt made me muuuuuuch louder in the water. That made it tougher as well. I decided to use an old oval IST mask replica. The mask was not well fitted to my face and it was rediculous to equalize but it was fun to use. It gave me an idea of how limited some of the equipment was in those days. You had to improvise and adapt to the limitations of the equipment. It taught me a lot about diving. The polespear is normally its own challenge. I have competed in polespear meets in the past and always remember them as a challenge. This meet, the polespear seemed like the least of my worries and didn’t seem like much of a challenge at all. With all of the other issues to deal with, the polespear almost seemed natural. The lack of boat also limited options. I had figured, going into the meet that somebody with a kayak or paddleboard would have an advantage. I found out that there was no real advantage to be gained. Somebody who had a kayak wouldn’t be able to get much further than me diving from shore and the mobility would be more limited. Think of it this way, when you can’t dive deeper than 20-30 feet, where can a kayak get you that you can’t get to almost as fast from shore? There are not a lot of options. I figured if somebody made it to zuniga, they were going to take it. I don’t think anybody tried. The surf was up, the water was warm…. if you had a wetsuit. The fish were hiding. All-in-all, it was a very challenging day! But that made the beer and conversations even better at the weigh-in. A lot of people got really into it! I saw some home-made setups and gear. 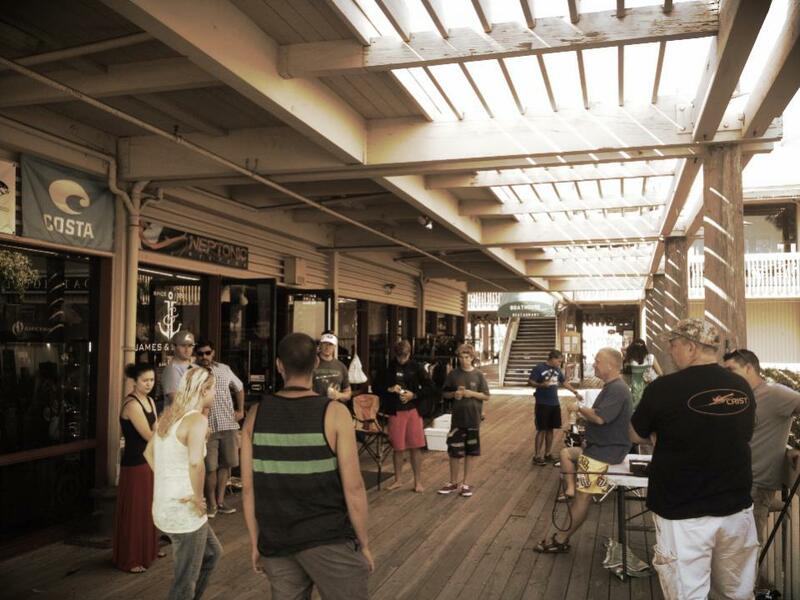 I saw a homemade hawaiian sling, some authentic fins, an authentic mask, a homemade snorkel, some original udt shorts etc…. It was really cool to see some guys get into the spirit. I had three goals in mind with this event. First and foremost, I wanted to increase the visibility and do something for the WA. Some guys showed up just to support the WA and I really appreciate it. The Watermen’s Alliance is doing great things representing our community and we need to do whatever we can to help them out. Second, I wanted to gain respect for the old timers. What we call an “iron man” meet was just normal diving for them. The challenges they had to go through to start our sport and make it accessible to the general public are nothing short of amazing and they have my respect. Some of the improvised/homemade gear that I saw at the meet just reinforced that the spirit of invention and adventure is still alive in our community. If nothing else, that made this meet amazing. Third, I wanted to have a meet that was “old school” in the aspects of hosting the meet. I didn’t want a raffle or a big bbq with catered food. 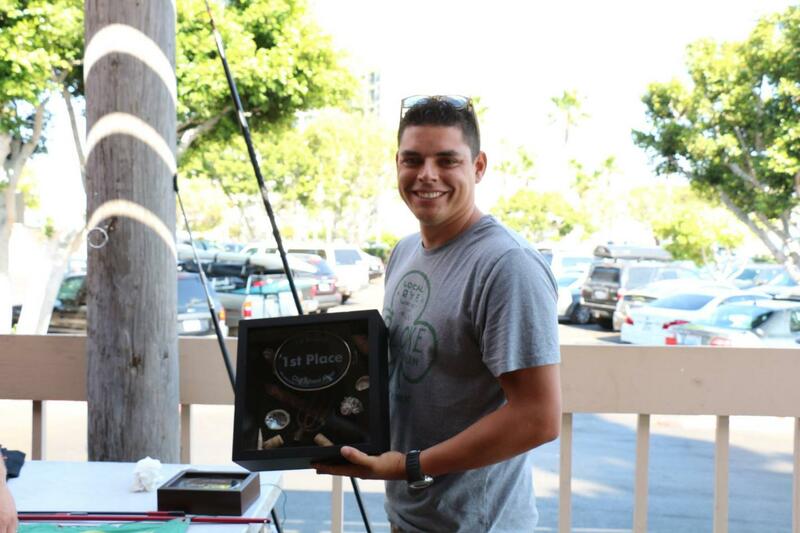 I didn’t want fancy boats or complicated trips or major prize money. I wanted a simple day with cool people who enjoy the water. I wanted the day to be about diving and learning and sharing with friends. 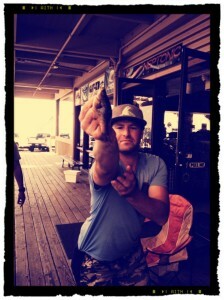 The meet was small, the weigh-in was small, the fish were small. It reminded me of the PCCs in a lot of ways where everyone who came had a great story to share and was friendly. I feel like the meet broke down barriers among those who competed. I also think there are some great stories to take back to the divers’ home clubs. Competing in a meet this challenging brought us together. My favorite part of the day was when a group of us had just got out of the water at a local jetty. We saw some new spearos in their 3mm surf suits and their little jbl pipe guns. They looked at us with no wetsuit, polespear and opaleye in tow and they thought WE were the kooks. I would like to thank those who competed for their tenaciousness and friendship. I would like to thank those who sponsored the meet. Crist Polespears came through in a HUGE way! Not only did Aaron Crist attend the meet, but he brought three polespears for the winners and to donate to the WA. I will be holding a raffle soon for the remaining spear. That is really big and I can’t thank him enough. Dustin at Gat-Ku also made an appearance and donated a polespear. Dustin normally hosts a polespear meet in San Diego and is one of the inspirations for this meet. When I started spearing, I couldn’t wait to get my hands on a gun and do some “real spearfishing”. Little did I know that I had bypassed a very important step and learning experience with the polespear. I would also like to thank Sturgill spearfishing. The float in Kelsea’s picture is just classic. 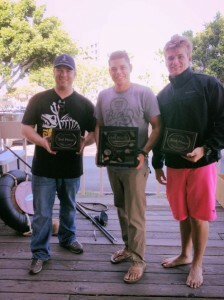 A big thanks to James and Joseph (speardeals) in San Diego for hosting the weigh-in. Local dive shops are super important and J&J are one of the best! 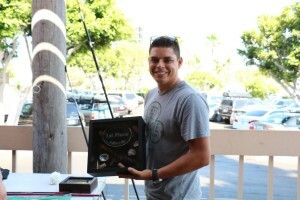 2nd place went to Kyle Parker, also with a five fish stringer of perch….. and a way with the ladies! I look forward to seeing you all next year!